Justice for Janitors Makes History! Rocking for Peace for 50 Years! Comments Off on Rocking for Peace for 50 Years! It is amazing for me to see grassroots community institutions like the Washington Peace Center not only survive – but thrive for 50 years! WPC holds a special place in my heart. I served as a coordinator there from 1987-1994 when I left to join the labor movement. I learned so much here about building organization, coalitions and movement building as we worked to build an anti-racist, multi-cultural organization in the Nation’s Capitol. 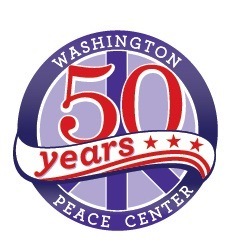 I am so proud of the Washington Peace Center and it’s terrific staff including Sonia Silbert and Dany Sigwalt! It was wonderful to see so many old friends and new singing, eating, sharing stories and dancing the night away. Here are links to photos and the new WPC 50th Anniversary Video just released!